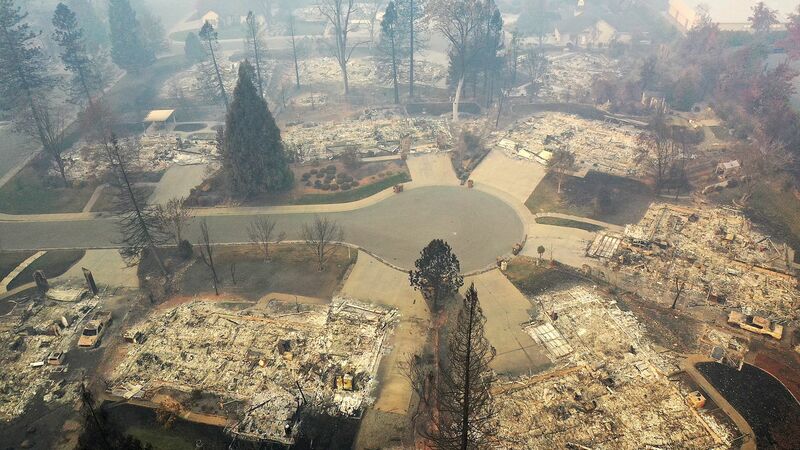 California's Camp Fire has now claimed 63 lives and destroyed at least 9,844 homes, 336 commercial and 2,076 other buildings. A staggering 631 people are now listed as missing, a up from previous figures of around 200. Why it matters: The Camp Fire is California's most destructive and deadliest wildfire on record, surpassing records set just 13 months ago. The fire is causing dangerously poor air quality to blanket the San Francisco Bay Area, threatening to aggravate chronic health conditions including asthma, heart and lung disease. Schools are closed due to the poor air quality, and many people have had to wear masks to block particulate matter from getting into their lungs. The big picture: No single factor — not climate change, forest management or building practices — is responsible for the deadly blazes the state is now seeing, experts tell Axios. Instead, it's their combination that's making an already dicey situation far worse. And the outlook in coming years, as climate change continues, is foreboding.